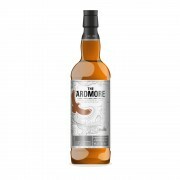 My first Ardmore, will it be my last? Double cask matured in American white oak bourbon barrels and half port pipes. Twelve year old..
Firstly, the colour on this one is very delicate - mild ruby tones. It looks interesting. Aroma - full and sweet. Toffee and vanilla. Taste - the bourbon ageing really comes through for me on the flavours. The partial port time doesn't speak as loudly. Mild astringent tones. Not as much robust character on the taste as the aroma. I liked this but would love to try another of their scotches on either side of this one. Not rushing out to buy a bottle.